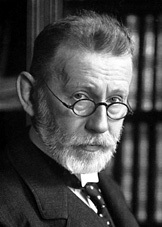 Paul Ehrlich (1854-1915) A gifted bacteriologist, Ehrlich’s first major work was in creating a serum for diphteria, together with fellow German scientist von Behring. However, von Behring screwed him over and stole all the recognition (and money), winning a solo Nobel Prize in 1901. Unfazed, Ehrlich moved his attention elsewhere, isolating a compound to treat sleeping sickness. This won him a Nobel prize in 1908, along with fellow Jew Elie Metchnikoff. However, Ehrlich is most famous for creating Salvarsan, a drug that essentially cured syphilis. This was the most widely prescribed drug in the world for over 30 years! Aside from this, Ehrlich invented the earliest type of gram-staining (perhaps the most important tool in bacteriology), the concept of a “magic bullet” drug, and coined the term “chemotherapy”. This entry was posted in Science & Technology and tagged bacteriology, Chemotherapy, diphteria, drug, German Jews, is Paul Ehrlich jewish, Magic Bullet, Nobel Prize, Pharmacy, Salvarsan, sleeping sickness, syphilis, Vaccine, von Behring on August 18, 2011 by Jew of the Week.